I’m so excited to be a guest on Delilah’s blog. We’re in the same RWA chapter, and I can tell you, she’s a fabulous lady. I’ve been writing the first draft of a new historical, and I’m spending countless hours online researching to get all the historical details correct. By day, I’m a librarian, so I find research half the fun anyway—I’m just weird like that, I know! Who would you want to see on a casting couch? Leave a comment for me on Delilah’s blog, and I’ll give one commenter a copy of the ebook! Sandra Jones is the author of sensual historical romances. She worked as a bookseller and as a librarian, where she indulged in her love of old books. When not researching or writing, she enjoys being with family, reading, and watching British TV. A self-proclaimed history geek, she currently lives in a 1905 Greek revival home in the Mississippi Delta. Sandra’s latest is HER CHRISTMAS KNIGHT, a medieval romance story included in FIVE GOLDEN RINGS: A CHRISTMAS COLLECTION, available in ebook now from Avon Impulse and in paperback in January. The holidays are a time for wishes, magic and, of course, love. 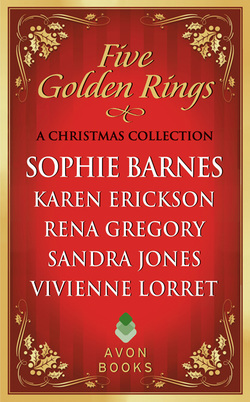 Celebrate the season with this delightful collection of Christmas tales. What better way for Connor Talbot, Earl of Redfirn, to spend the holidays than convincing Leonora Compton that the only match she needs to make is with him! Phin Baldwin does not believe in Christmas magic … until the clever and beautiful Ginny Overton gets it into her head to show him how wonderful it can be when wishes come true. Just returned from the Crusades, marriage is the last thing on Sir Caerwyn’s mind. But will he be able to resist Lady Nia, the thief of his boyhood heart, when she tempts him yet again? Responsible Ethan Weatherstone is determined to save Penelope Rutledge—and her reputation—from her silly scheme, but can he save himself from the temptation of her lips? His chest tightened. He’d kept the memory at bay for too long to let her remind him. He barked, “Now you want to tease me! Aye, you deceived me today, and you betrayed me then. What point are you trying to make?” Mayhap she enjoyed pushing the knife deeper into his heart. “I practice in mail often. My father disapproves, of course. Serena’s worn it only once. In armor, she would look like a man from behind, don’t you think?” She moved closer to the bed, took hold of the thick banister. When she glanced over her shoulder at him, the sight of her posture, so sensual, so seductive, yet so unpracticed…sweat glistened on his brow. This entry was posted on Monday, December 17th, 2012 at 7:36 am in General. Tagged: Guest Blogger. You can feed this entry. Both comments and pings are currently closed. I think that you could use any of the gentlemen who have played James Bond. Chanum Channing from Magic Mike. Wonderful suggestions so far! I think I’m with Margaret on Richard Armitage. I haven’t seen any of his films, but he’s just yummy in period costume. Any of these guys are welcome on my casting couch! Those are some great choices! Gorgeous man candy! I’d like to add Jensen Ackles (Dean Winchester is what I’d like to find with a bow on Christmas Day). Love the sound of the new book and so hope I win! My guy would be Jim Caviezel who stars in “Person of Interest”. He could own me lock, stock & barrel. Chris Hemsworth from Snow White and the huntsman. I loved both of those movies…I have watched them over and over agin. I am adding this book to my need to get list. I’d love to see Gerard on the couch…..I mean the casting couch….because my couch is in storage. Nice to meet you. Why is it I always love the guys with an ascent? Hugh Jackman, Gerard Butler, Matthew MacFadyen from 2005’s Pride and Prejudice, maybe even Chris Hemsworth (from Thor, little pretty, but manly). Hmm…I don’t really keep up with the stars today so I don’t have any new suggestions (and I’ll have to look up some of these guys since I don’t know who they are!). Nice intriguing excerpt, thanks for sharing. who else looks GOOD shirtless?? ?